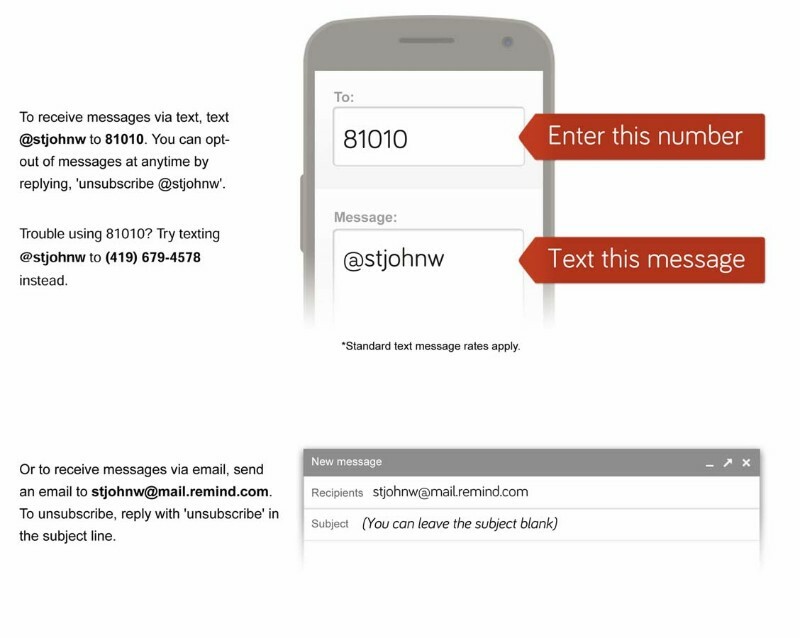 In an effort to keep members up to date with news and activities, St. John has signed up for a text and e-mail message service through Remind. If you are interested, instructions are included below. We promise we will not ‘spam’ you with multiple messages a day (special event reminders and news only), your information will not be shared (we won’t see your phone number and you won’t see ours), and you will not be added to a group text (any replies come to the church office, not the entire group). If you have any other questions about the service, please let us know. If you have trouble using 81010, try texting @stjohnw to (419) 679-4578 instead. There is no fee/cost for the service except for whatever text message rates you pay to your cellular service provider. On the web, click here.